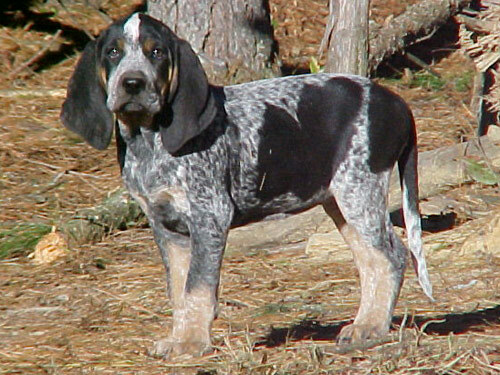 Originating in Louisiana, the Bluetick Coonhounds ancestry can be traced back to the Bleu Gascogne French hounds. A born hunter, this breed excelled in tracking and treeing raccoon, opossum, bear, and cougar. They are able to perform their hunting duties in any weather and terrain. Bluetick Coonhounds are most noted for their cold nose that gives them the capability of tracking very old scents. The Bluetick Coonhound is heavily muscled, large, and powerful. This breed is a combination of agility, great endurance, kindness, and self-confidence. They are intelligent and have a highly developed sense of smell. They have exceptional eyesight that gives them the capability of being a proficient hunter at night. This breed is loyal, deeply devoted, attentive, and fearless. The Bluetick Coonhound makes an excellent family companion and guardian. They do best in a home with older considerate children. They are reserved with strangers but are not typically aggressive. They get along with dogs they have been raised with but are not recommended for homes with cats or other small household pets. The Bluetick Coonhound will most generally howl excessively and be destructive if they become bored and lonely. This breed requires weekly brushing of the coat to minimize loose hair. Bathing or dry shampooing should be done when necessary. The ears must be checked and cleaned on a regular and consistent basis to prevent infection. The Bluetick Coonhound is a relatively healthy breed but may be prone to cataracts, hip dysplasia, and Krabbes disease. The Bluetick Coonhound has a dense, short, smooth, and glossy coat that is coarse in texture. The tri-color coat is quite unique. The base color is white with a heavy ticking of black hair, which gives it a speckled blue effect. There are tan markings over the eyes, chest, muzzle, lower legs, and feet. This breed is a continuous shedder. Early socialization and obedience are an absolute must for the Bluetick Coonhound. This breed does not respond to harsh or heavy-handed methods. Training must be done with motivation, patience, firmness, fairness, and consistency. They excel in hunting, agility, and tracking. The Bluetick Coonhound requires daily vigorous exercise. They thrive on human interaction and being given a job to do. This breed is not recommended for apartment or city dwelling. They do best in a rural secluded setting where they can romp and roam freely and safely or in a home with a large securely fenced yard.